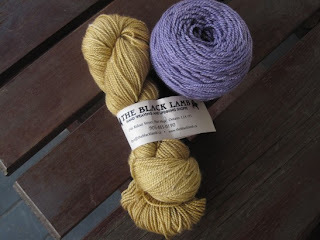 Since it rained the last three days such that I couldn't get photos of what I really-most-especially want to show you, I thought I'd mention that just before I left the Frolic on Saturday I solved the yarn shortage problem for the Purple Baby Sweater. This supplement yarn is of pretty much the same fiber composition but dyed by The Black Lamb. It doesn't scream at the purple so should play nicely in stripes, it's still pretty gender-neutral, and it's called Maple Sugar, which I think is a good name for a Canadian baby don't you? and I am not emotionally prepared for either of those things yet. Oh, and colour considerations for the Deco project. Can I get away with camel over a predominantly black and grey wardrobe do you think?